Premium finish… tested and certified. Columbia Forest Products launches UV LabCoat™, a new pre-finished hardwood plywood with a premium topcoat that offers even more depth, clarity, and durability than our standard UV offering. It is compliant with the Scientific Equipment and Furniture Association (SEFA), enabling it to be used in labs, schools, institutions and other commercial installations that require the chemical resistance of a laboratory grade finish. Combined with our PureBond® formaldehyde-free hardwood plywood technology, UV LabCoat panels will enhance and improve your next project meeting the highest standards for appearance, performance and indoor air quality. Since 1996, Columbia Forest Products has delivered over 16 million UV Wood panels to the industry for those seeking a beautiful, pre-finished hardwood plywood panel with the convenience and durability of a VOC-free UV topcoat in both clear (UV Wood) or stained (CustomColors™) options. Customers appreciate both the time and cost savings in their facilities and the added benefit of no VOC emissions. “This new UV LabCoat finish option offers improved esthetics plus excellent chemical resistance while maintaining the depth and clarity the market has come to expect from Columbia’s finishing line,” explains Tom Pearsall, Manager of Marketing and New Product Development. UV LabCoat passed three SEFA-certified tests: the 49-point 8.1 Chemical Spot Test, the 8.2 Hot Water Test and the 8.3 Impact Test. This new SEFA-compliant laboratory grade finish will be available from Columbia’s four regional finish line facilities allowing for easy delivery from almost anywhere in the US and Canada. SEFA-compliant panels that provide a chemical resistant finish. UV LabCoat passed 3 certified tests: 8.1 Chemical Spot Test, 8.2 Hot Water Test and 8.3 Impact Test. Beautiful UV finish that resists scratches and chips and passed a 49-point chemical test. A 100% Solids, VOC-free product ensures no degradation of indoor air quality. 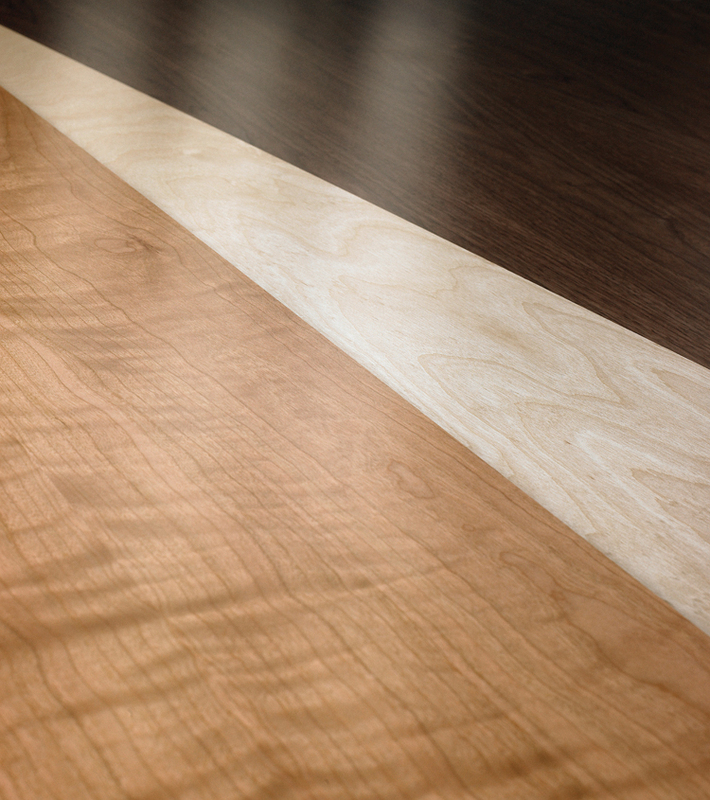 Premium, Full-Fill™ finish adds luster, depth and clarity to the decorative wood veneer. Finished surface reduces labor time, increasing productivity and efficiency in fabrication. Four regional finish line facilities across North America for consistent availability and prompt delivery. PureBond formaldehyde-free technology complies with CARB Phase 2 regulations and can contribute to LEED® credits. 50 million panels produced with PureBond – a proven solution. Over 50 years of making the industry’s superior hardwood plywood.